As the iconic mascot turns 120, we take a look at its twisted beginnings. The smiling Michelin Man celebrates his 120th birthday this year, having ably served as the face of the French tire giant for over a century. But a peek at the iconic mascot's earliest designs shows that face wasn't always so friendly—in fact, the Michelin Man's earliest iterations hit the modern eye like a vision of vintage surrealist horror. Don't worry kids, Bibendum is your friend! Bibendum—yes, that's the Michelin Man's real name—sprang into existence at the dawn of the 20th century. Company legend has it that brothers Édouard and André Michelin first dreamed him up after spotting a stack of tires at an exposition in Lyon in 1894 and deciding that it sort of looked like a man. Whether or not that apocryphal moment really happened, four years later their fledgling tire company commissioned a French cartoonist working under the penname O'Galup to bring their imagined mascot to life. 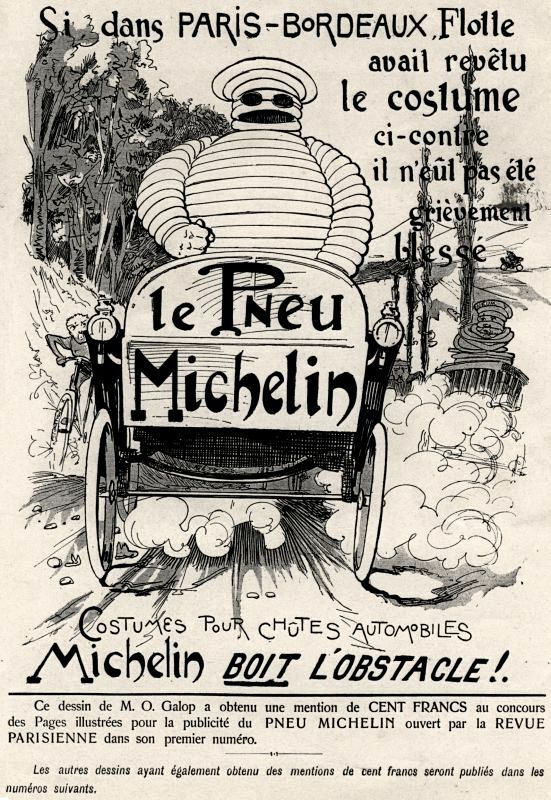 That first ad in 1898 showing the Michelin Man...creature is bizarre today for many reasons. One, Nunc est bibendum is a quote from the ancient Roman poet Horace that translates to Now is the time for drinking (the bottom line in French reads the Michelin tire drinks up obstacles). Two, the artist opted to preserve the "stack of tires" design by making Bibendum's mouth a hinged maw that tilts back the top two-thirds of his head. Three, there are no eyes behind those pince-nez glasses, but he's still got very human hands. And four, Bibendum's grotesque, almost reptilian companions are supposed to represent the weak competition but instead give the impression that the Michelin Man presides over a court of monstrosities. The contemporary reaction was much warmer, and the Michelin Man appeared in a very similar format in the company's ads over the next few decades. His appearance got slightly more refined as the years went on, but he remained the same rubberized, slightly malevolent, and deeply strange being. Here he is with black holes for eyes; here he is committing harakiri to save a stranded family; here he is as a conquering gladiator who just stabbed an opponent to death. But that's just scratching the surface of how weird the Michelin Man's early years really were. As long as he existed on paper, Michelin toyed with various ways to physically bring him to life. These pictures show various designs that look like something H.G. Wells might have dreamed up, bizarre and eerie protoforms whose unnatural shapes unsettle something deep inside our modern minds. Here's a bunch of them in a swing band, because why not. Truly surreal. Thankfully, both Bibendum's print and physical manifestations eventually evolved into the friendly marshmallow man we know today, and he's endured as one of the longest-running corporate mascots in history. But we'll never forget those early weird years, if only to remember how the world has changed since then. Creepiest car video you'll ever see. Using polymers derived from wood instead of oil could save money—and maybe the planet.